Hiss. Buzz. Crackle. All night long, every night, I listen to the monitor from hell. Got to replace the battery to see if it will stop its loathsome sputter. 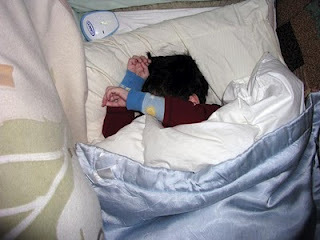 That monitor is one of those things that we can’t live with and we can’t live without, had been there for us when Calvin had a seizure in bed while we were eating dinner once. We’d found him mangled, partly on his stomach, partly on his back, with his face smashed into his down comforter. Finding him like that made me wonder, if we hadn’t had the monitor, would he have suffocated during that seizure? Would we have gone up to bed that night to have found him dead, like some parents of kids who have epilepsy do, like all parents of kids who have epilepsy dread. The downside of using the monitor is that I get very little sleep, waking to every stir, swoosh, sigh, whimper, snort, rustle. This morning, long before dawn, not unlike the previous five mornings—perhaps the previous five years—I awoke to the sound of my boy smacking and rubbing his forehead, likely due to a headache either from his new anticonvulsant drug, his ear infection, or both. So I repositioned him and covered him for what felt like the millionth time, and gave him a Tylenol and a sip from his bottle. Within forty-five minutes he was asleep. no issues at birth, normal delivery. Began having seizures at 3 mos. following DPT immunization. Hundreds of myoclonic seizures per day. Lived this way until aged 7, when seizure type flipped abruptly to grand mal. About 80% of his seizures last longer than 30 minutes. They can go up to 90 minutes. He desaturates in many of them. Significant brain damage. Fourteen years old but developmentally about 3-4 years. Then I realized how so many of us have it hard, some more than others, and I stopped feeling sorry for myself, wanted the hurt of others to go away. Calvin slept soundly the rest of the night and didn’t wake until six. I rolled out of bed feeling somewhat rested and thankful that we weren’t in a hospital, thankful that the night’s anxious, hopeless, melancholy dissolved some with the dawn. And reaching over to turn off the hissing monitor I heard my child’s sweet eager coos calling for his mama, even amongst all the hissing and crackle—and I felt grateful. In honor of epilepsy awareness month, please share Calvin's story and help bring us one step closer to a cure. It's as easy as pushing a button.